Vincent is like the slow, peaceful movement in a concerto or a symphony. While the first movement made you jump with excitement and your heart almost beat right out of your chest, the first notes of the slow movement ring out and in a few brief seconds a feeling of intense, profound calm comes over you. Your thoughts vibrate in unison with your body. Nothing has changed around you, the same people are sitting next to you yet nothing seems the same, you have entered into communion with yourself and with the world. Like a migratory bird, Vincenzo has chosen to live in tune with the rhythm of the seasons, rather than with that of modern society. And as everyone knows, the seasons in Quebec are well defined. The long months of winter spent inside are ripe for reflection and a certain inner peace; when the temperature starts to become milder, it's time to get back in touch with nature and to watch the plants come out of the ground and grow. Like nature, the creative process imposes its own slow, sometimes uncertain but always immutable rhythm. A relationship develops between Man and his environment. Passing time becomes almost palpable. The seasons and their diversity are so many elements that become familiar and revitalizing for Man. Man detaches himself from the 24-hour day to become more available, the better to listen to the elements (wood, fire, earth, metal, water), the better to capture their energy. All creation passes slowly through several steps of maturation that put the artist's patience and determination to the test. Sculpture takes a lot out of you; it requires total investment. It can take years to make a sculpture. Could that be why it has become a rarity in the world of art these days? From his childhood vacations in the Vosges with his grandfather, Vincent became familiar with Nature and learned how to respect it. This was a period ripe with the discovery of the shapes of rocks and wood (hollowed-out, striped, polished by Nature), but also of culinary discovery (mushrooms, strawberries, blueberries, currants, pine sap as chewing gum) and olfactory discovery (fresh cut hay, forest moss and earth, pine needles). Vincent's work and artistic approach are concrete applications of his rapport with Nature and with his fellow Man. "I don't distinguish Man from Nature; Man is part of Nature. When I associate a stone with my sculpture, the latter adapts to the shape of the stone. I don't sculpt the stone; I don't transform it to suit my needs. On the contrary, I work with it to make a sort of pact of mutual love and respect. Even if it's a stone, it has a life of its own." His way of seeing things does not impart hate or resentment; his art seems to be a metaphor of the reconciliation between Man and Nature, between Man and his own reflection, between Man and his conscience. Vincenzo speaks of an energetic approach to sculpture. By associating himself with the shapes of Nature, he attempts to capture its energy and establish a balance between Man and his natural environment. Even if he sometimes includes natural elements in his sculptures, the shapes that he gives to metal can also have their roots in Nature. That is why he considers his sculptures as representations or fragments of Nature, which he protects the same as a forest or a lake. What is more, his sculptures are conceived to be displayed outdoors, in their natural environment, but also in an urban or interior environment: "they are happy, near me in my house." 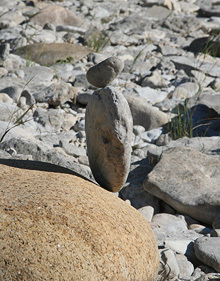 He also builds ephemeral sculptures to help find his way, by piling rocks or pieces of wood on top of each other. After a while, the wind knocks them down and they retake their place on a riverbank. Vincent has a dialogue or exchange with Nature, finds his inspiration in it, listens to it, like a tree that shoots its roots deep into the ground and lifts its branches into the air to get its energy. Vincent has developed a vision that is more that of an aboriginal than a white man, in the sense that he adapts to Nature and not the contrary. He is completely closed off to the industrial vision of the modern world that consists in reproducing an infinite number of the same plans, the same way of living and especially the same way of thinking and which is overly obsessed with domesticating the planet. On the contrary, he believes in uniqueness, in the ephemeral and in the ravages of time, which alter both Man and his environment. To capture the essential and give it shape, you first have to get rid of everything superfluous, show a sense of humility and be capable of shutting yourself off from the hustle and bustle of the world. That is the path that Vincent has chosen to follow. He makes one think of a migratory bird travelling the world in a reverse migratory route. While men shaped by modern society run around, seek extreme emotions, gather together and make of themselves copies of yet other copiers, he seeks out a universe halfway between Nature and creation, between rock, wood and metal. He reinvents a usefulness for these elements, pays them homage and gives them a new existence. His hands take hold of the raw material in order to give it shape, volume, curves, its own dynamic. His look questions, interrogates and asserts itself against the hectic pace of a nonstop world that is losing its identity. His sculptures bear witness to a long journey, a wandering, a quest. Like communication devices, they give us a message that tells us to open up our senses and our minds in order to capture what is essential in life. While discovering his sculptures, your eye will no doubt first notice the material, the shapes, the colors. You may then want to continue this initial contact by lightly running your fingers over the surface of one of them. You will probably be surprised by their tenuous balance, which causes in some people a gentle rocking, like that of a rocking chair. Vincent imparts a certain breath to his sculptures. He compares the rocking sensation to the regular beating of a heart, which is a pump to help air enter and exit; air: symbol of life. This particularity gives an organic aspect to these metallic shapes, it softens them by removing them from their static aspect, like tree branches swaying in the wind. Technically speaking, we could see in that a clear intention on the part of the sculptor to take pleasure in defying the laws of physics: "Here, gravity is just a process, but it's defying what is impossible that attracts me. Just showing that it's possible to do these things, which should be impossible according to our perception, our judgement, society's judgement. It's cultural." "Showing that people see things according to their beliefs and showing that they are wrong to say that this is impossible because I am like this or because I was taught that it was impossible, that disgusts me!" What is the best way to feel alive? One of the answers would be to spice up your life to make it more palatable, more interesting. Adversity, when sought out, can actually be a means of going beyond one's abilities. We can speak of the pleasure of adversity, the pleasure or excitement of the unknown. Maybe that is another possible answer? Vincent's sculptures seem to ask questions but also to give the answers. His sculptures, which swing and sway on their weight. The result is a sensation of imbalance, but I think that the sculptor is leading us astray. Children on a swing set, an old man smoking a pipe in a rocking chair, a boat bobbing with the tide, a weathervane turning with the wind, a kite, sails, tango dancers... a certain feeling of communion can be felt between people and the elements, a great harmony and serenity that is both intoxicating and peaceful. In the tango, the man causes an imbalance for the woman. This imbalance allows the dancers to bend, to lean on each other and go forward with confidence in a world they themselves create with each step and embrace. In seeking to separate himself from contact with the Earth, with Nature, Man denies a part of himself and by neglecting this part, he neglects himself. Vincent is a mystery unto himself. He travels between sensitivity and mistrust, between simplicity and demands, between love of beautiful things and just plain love... Eternally in love, with a big appetite for life, his apparent calmness sometimes masks a latent violence that he only expresses in the complexity of curves and shapes that give his sculptures life... They crisscross, meet each other, reject each other, avoid each other to better fit together in the end, always in balance... Simplified and tormented at the same time, they reveal all the complexity of their creator. 3 or 4 primary colors – no nuances – because Vincent knows what he wants. And he will give himself the means to realize the various projects that have been developing in his head for several years, with his love for things well done, which guides his daily work. Enigmatic, whole, epicurean, curious... but above all, passionate! Vzo is not always in tune with our reality. Alone, he explores his own interior world; a world that we can see partially in the audacious translations that are his sculptures. The artist has a heightened sense of things and develops an original sense of perception. He draws up a plan, picks up stones, tortures bronze, adds wood and thus advances without any apparent logic. He goes forward with balance, with the concern of work done well. The elements come together, break apart and get back together eternally in his imagination, all the while remaining instinctive in his relationship to the work. After a long gestation and numerous studies, the sculpture appears to have been conceived in the absence of all reasoning, as if it sprang directly from his unconscious mind. When we see the entirety of his work, we are struck by the profound genius of the sculptor and his desire to approach the ideals of truth and happiness that are so dear to him. He succeeds through a transgressive process of connections, interactions and metamorphoses. And out of the diversity of materials, the interpretation of shapes and the purity of colors, from bud to flower to fruit, surprising combinations are born.